Do you want to build your own an amplifier? Or do you want to build your crossover for an active system? We offer you kits and components in very high quality. 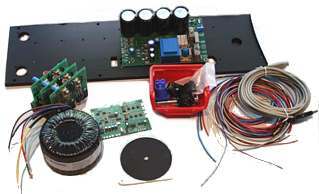 Coolback is offered as system kit with all included: Coolback 300 or 600 plate, modules, connectors, switch, leds, wires, screws, distances, washers. The last digit of the part's number indicates the number of power amplifier modules PA3CC supplied with the kit. Coolback (Coolkit) contains a digital crossover DCN 23 with digital signal processor. In addition stable power amplifier modules are delivered with power supply and transformer. Building instruction for building up coolback kit 603. The Active Speaker Management System is mounted on the back of a speaker. All electronics are assembled on the coolback (back plate) which is acting as a heat sink for the amplifier modules. Visible outside are the connectors (Balanced Input, PC Communication and Power inlet), Function Switch (ON-OFF-AUTO) and LED Indicators (ON-Standby). The Coolback 300 aluminium sheet is 150mm wide and 550mm high - a thickness of 10mm - a flange of maximum 20mm for mounting.. The Coolback 300 offers a nice power package in small dimensions and features all of the same benefits which our bigger systems do. The Active Speaker Management System is mounted on the back of a speaker. All electronics are assembled on the coolback (back plate) which is acting as a heat sink for the amplifier modules. Visible outside are the connectors (Balanced Input, PC Communication and Power inlet), Function Switch (ON-OFF-AUTO) and LED Indicators (ON-Standby). The Coolback 600 is 220mm wide and 1000mm high - a thickness of 10 mm - a flange of maximum 20mm for mounting.